Visitation: Visitation is Tuesday from 2:00-8:00 p.m. at Anderson Funeral Service in Canton. The family will be present from 5:30-7:30 p.m. with a prayer service at 7:00 p.m.
Service: The Celebration of Life will be held at Canton United Methodist Church on Wednesday, November 14th at 11:00 a.m. Burial will take place at 9:45 prior to the service at the Worthing Cemetery. Mavis Stearns, 85, died November 11, 2018 at Dow Rummel Village in Sioux Falls, SD. The Celebration of Life will be held at Canton United Methodist Church on Wednesday, November 14th at 11:00 a.m. Burial will take place at 9:45 prior to the service at the Worthing Cemetery. Visitation is Tuesday from 2:00-8:00 p.m. at Anderson Funeral Service in Canton. 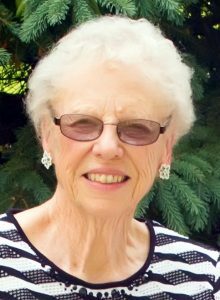 The family will be present from 5:30-7:30 p.m. with a prayer service at 7:00 p.m.
Mavis Marvel Urben was born October 23, 1933 at home one mile south of Worthing, SD to Ernest and Leone (Bong) Urben. She graduated from Worthing High School in 1951 and attended South Dakota State College in Brookings. She was united in marriage to G. Allen Stearns on November 2, 1952 in Canton, SD. Together they farmed and raised four children on the Bong farm one mile north of Worthing. In 1981 they moved to the Urben farm where she was born. In 2017 they moved to Canton. Mavis was a life-long learner and teacher and willingly shared her gifts and talents with others. She was an active member of Canton United Methodist Church and United Methodist Women. Over the years, she held numerous leadership positions at the local, district and conference level of the United Methodist Church. Mavis belonged to the Modern Homemakers Extension Club for many years and served as a 4-H leader in Lincoln County. She was a talented cook, baker, vegetable and flower gardener, seamstress, crafter and quilter. She was also the unofficial family historian. Missions were an important part of Mavis’s life. She and Allen went on a mission trip to Jamaica and participated in the Habitat for Humanity Jimmy Carter Blitz Build in Eagle Butte, SD. She and her daughters also traveled to Baldwin, LA and worked at the United Methodist Committee on Relief (UMCOR) Sager Brown depot sewing school bags and assembling relief kits. Mavis also volunteered at Love Inc Clothing Closet in Canton. A loving mom and grandma, she will be greatly missed by daughters Cynthia Nelson and her husband Jeff and Michele Olsen and her husband Tom of Sioux Falls; sons Mark and his wife Jill of Madison and Craig and his wife Lee of Worthing; 10 grandchildren, 21 great grandchildren and a sister Lorie and her husband Fred Grau of Norwalk, IA. She was preceded in death by her husband on June 20, 2018, her parents, an infant brother, sister Janet (Fodness) Thoe, and infant great granddaughter Kendra Faith Stearns. Memorials may be directed to the Canton United Methodist Church, the United Methodist Committee on Relief (UMCOR), or Love Inc Clothing Closet at 111 East 6th Street in Canton. Mavis as a very caring worker with the Dakotas Conference. Devoted in her person and thorough with her vision. Well done, good and faithful servant. My heartfelt sympathy to all. I always remember Mavis’ smile & the laughter! Cherish the Memories!